Patong Beach does not feature a great deal on this blog. That's because on the whole I don't like Patong, and rarely go there. 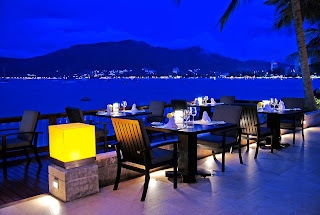 Sure, you can find some great restaurants, and there are some stand out hotels which are already listed in my Recommended Phuket Hotels. 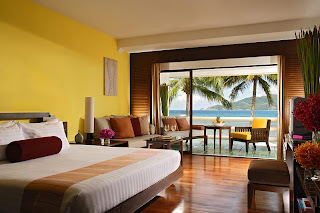 The Amari Phuket Resort certainly merits a recommendation, and I was reminded of it recently when an old friend came to Phuket and we went to meet her at her hotel - the Amari. As we wandered along the pathways looking for my friend's room, and headed past the seaview bar and a restaurant or two, down to the pool by the beach (a little bit of beach that nobody else can get to except hotel guests), I got that "Wow, I'd like to stay here" feeling. Everyone looked to relaxed, so comfortable, so unhassled. 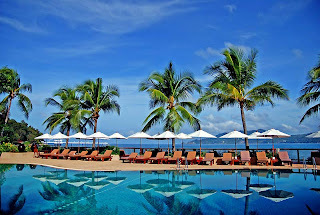 I guess the secret is that the Amari is not really on Patong Beach, it's "just off" Patong, so you can easily head into town for .. well, whatever you need, and then go back to the hotel to relax. 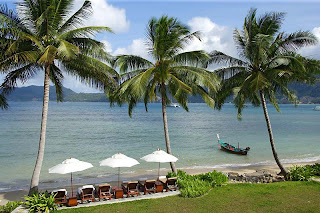 And if the Amari is not relaxing enough, carry on over the headland a few km and you reach Paradise Beach... See, I am not a fan of Patong but there are a few nice bits near Patong!